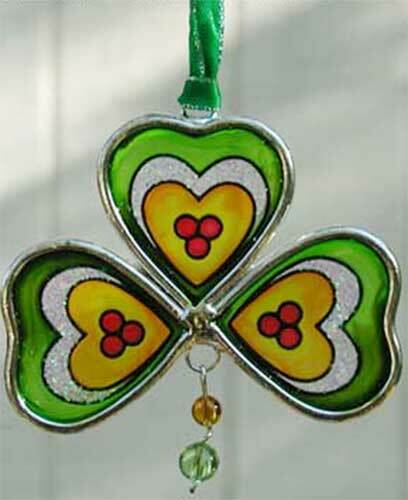 Stained glass shamrock would make both an ideal suncatcher or an Irish Christmas tree ornament. This shamrock ornament is made in Ireland by Clara. This stained glass shamrock ornament features a colorful design that measures 3" wide x 3" tall. The Irish ornament is ready to hang on your Christmas tree with the included green ribbon or you may hang it in a window as a suncatcher. The Irish suncatcher ornament is complete with a metal frame and it is gift boxed with a shamrock history card, compliments of The Irish Gift House. Claddagh sun catcher is a stained glass design that may also serve as an Irish Christmas ornament. Stained glass Celtic cross would make both an ideal suncatcher or tree ornament. Celtic angel is a stained glass sun catcher that may also serve as an Irish Christmas ornament.